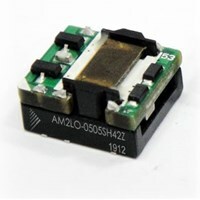 The AM2LO-Z is a brand-new SMD DC/DC converter that offers great cost savings thanks to an improved manufacturing process. It also features excellent reliability and performance, offering a standard input voltage range of 3.3 & 5VDC as well as an output voltage range from 3.3-5V, ±3.3 & ±5V. This low height profile and open frame design will surely benefit your new system design. This new series offers great operating temperatures, from -40 to 105℃ with full power up to 85℃. Also, an isolation of 4200VDC for improved reliability and system safety as well as a great 6 500,000h MTBF come standard. The AM2LO-Z is perfect for instrumentation, industrial controls, communication and IoT applications.